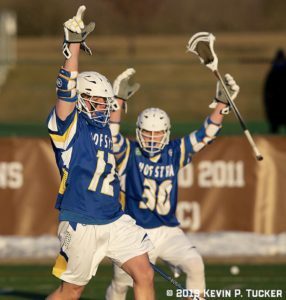 Hempstead, NY – Hofstra Men’s Lacrosse freshman Matt Elder has been named the Colonial Athletic Association Men’s Lacrosse Rookie of the Week for his performance in the Pride’s season opening victory at #13 Lehigh last Saturday. Elder, a midfielder from Mooresville, North Carolina, made his collegiate debut a memorable one as the newcomer scored the game-winning goal with 1:42 to play in regulation to break a 3-3 deadlock and give the Pride the victory in Bethlehem, Pennsylvania. Elder’s goal, which was assisted by a pass from sophomore James Philbin, capped Hofstra’s come-from-behind rally from a 3-1 deficit to start the fourth quarter. Elder and the Pride (1-0) will be back in action this Saturday, February 16 when Hofstra begins its home schedule at James M. Shuart Stadium against the Utes of the University of Utah (1-1). Game time is 1 p.m.